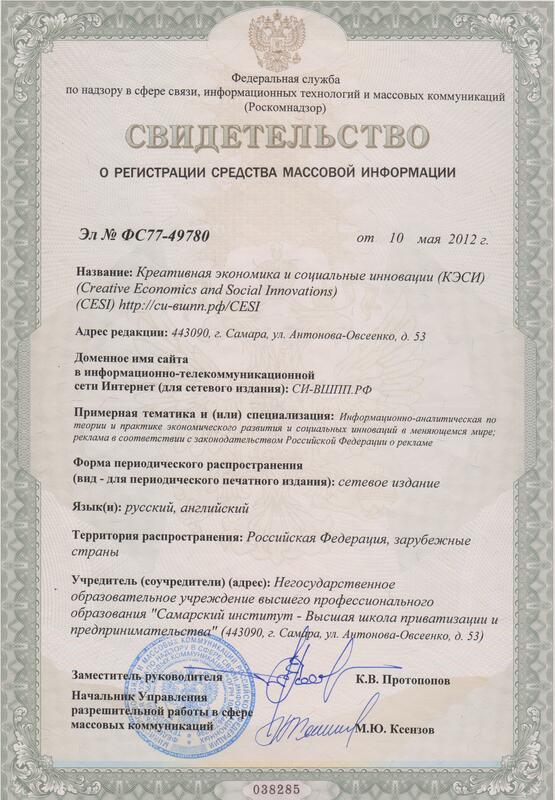 Papers may be presented in Russian or English (apr. 2500-3000 words) and abstracts (up to 200-300 words) should reach the Editors before 10-th March (spring issue), 10-th June(summer issue) and 10-th September (autumn issue) and 10-th November (winter issue) by e-mail samartis@yandex.ru. References within text is following: ……. [3, p.10]. References in end of article (in alphabet’s order). CVJETICANIN, BISERKA, DANIELA A. JELINCIC. 2002. Tourism as cultural system: A Discourse of structural analysis. Zagreb: Institute for International Relations. Books: CVJETICANIN, BISERKA, DANIELA A. JELINCIC. 2002. Tourism as cultural system: A Discourse of structural analysis. Zagreb: Institute for International Relations. Журнал зарегистрирован Федеральной службой по надзору в сфере связи, информационных технологий и массовых коммуникаций. ЭЛ № ФС 77 – 49780 от 04.05.2012 г. Copyright © 2019 КРЕАТИВНАЯ ЭКОНОМИКА И СОЦИАЛЬНЫЕ ИННОВАЦИИ. All Rights Reserved.